Tonight was an informal class, as one of the local universities is finishing up exams this week and the other is about to start. So the college student population in our classes is fluctuating and starting to dwindle. But the class also saw me getting to roll twice with Tim, which is always a good learning experience as he shuts down holes that I can usually at least find (and occasionally even exploit) even on purple belts. But with Tim, there is nospace. None.at.all. Which was amusing, as I’d go for the little space that’s usually there and would instead meet a solid mass of body and I’d be a bit confused because that’s always been there before. Where did it go…? My body hurt last week with residuals from the tournament, and finally settled down toward the end there. Now this week it’s hurting from getting back to training. Doh. So on Wednesday night, being the genius that I am, I decided to do some extra wrist movements after my workout. Instead of helping my wrist, I ended up making something twang hard. So I’ve actually had it in a (not very supportive, but at least it helps me remember) brace for the past 2 days. Then Thursday, the weather was so nice but it’s supposed to rain allllll weekend, and I had a couple buckets of daylilies to transplant (and some snapdragons that I’d picked up when I got soil for the daylilies), so I went home after work and did that instead of going to class. 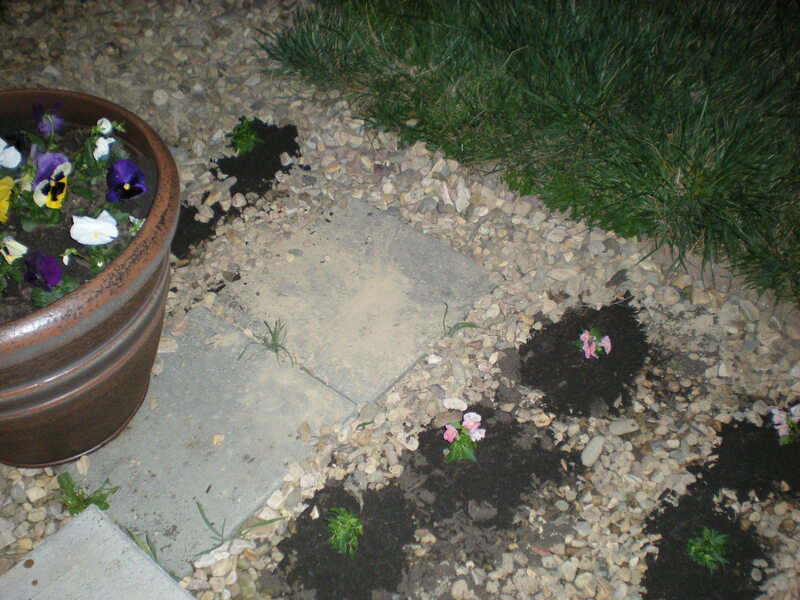 Worked for 2 hours, until it got too dark, though still had some flowers left. So no verdict on Thursday class yet. Short warmup, then drilling. Side control escape. Drilled with Ethan and Cesar. Rolls with Guillaume, Nolan (who used to train with us, gee, 2 years ago? I recognized him, but couldn’t remember his name. He remembered mine. [Rats. ]), and then one of the ones I just play guard against to stay safe. He was being slightly less spazzy than normal, so I considered opening up a little more, but as soon as I did I caught an elbow diving through straight to the face, so just went back to guard retention. 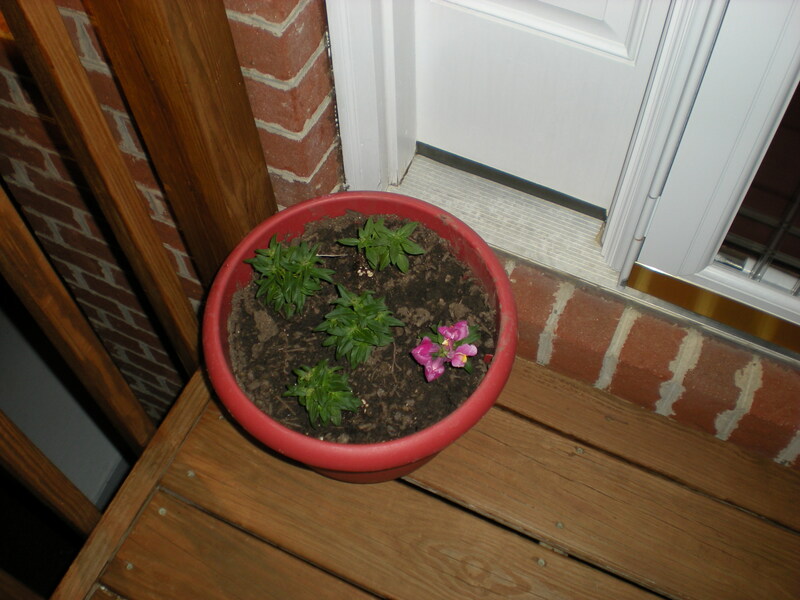 Got home and finished up the snapdragons. I have fleurs! Most of the beds around the front of my yard are just the rocks. (The ones in the back are mulched.) There are a few existing plants up front, but not many. 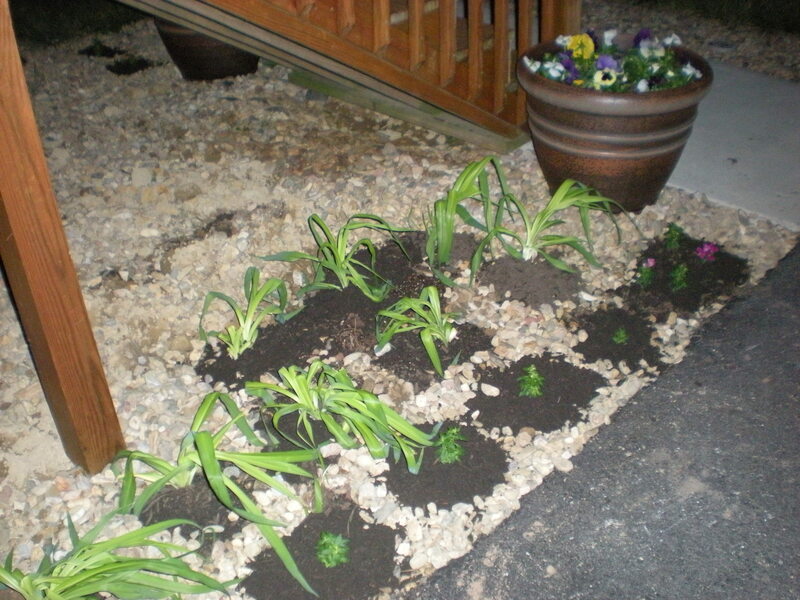 I eventually want to replace the rocks with mulch and have lots of flowers. I like flowers. There’s good news and there’s bad news. The bad news is that I have to go back up to Fairfax for work; meeting on Tuesday. The good news is that I’ve already talked to Maggie, and I’m going to train with her at Fairfax Jiu Jitsu on Monday night.